Cliffs, caves and stonework are the oldest carriers of images. With “I MURI” you are sort of following a certain tradition. Are you more interested in an archeological conservation or is it more of a pure artistic approach? In a documentary sense, I actually don’t think about images or art that often; that was never really a topic that interested me that much; neither documentation nor documentary photography; in this respect it is rather more like a snapshot or a momentary recording. Naturally, every recorded moment in time, like every picture that is made, every film that is filmed, every musical composition that is recorded, has a historical value in time. It is a recorded moment in time that appears differently now than it will in 10 years. Of course, this can be said in every case, but my intentions do not involve an attempt to preserve something. The cliff drawings in Kalahari or the Lascaux cave drawings or even the paintings in the Sistine Chapel: these also bear witness to time. Do your images show the reality of our current time? I don’t know. I always find the term “reality” quite difficult. It is always said that “the camera never lies”. This has a certain amount of validity, but you can also turn that phrase on its head and say “the camera always lies” because it always only shows a very specific part of something. But that cut-out part can also completely distort the realness of a situation that is real. In this sense, the crop is manipulative and that applies to my images as well. 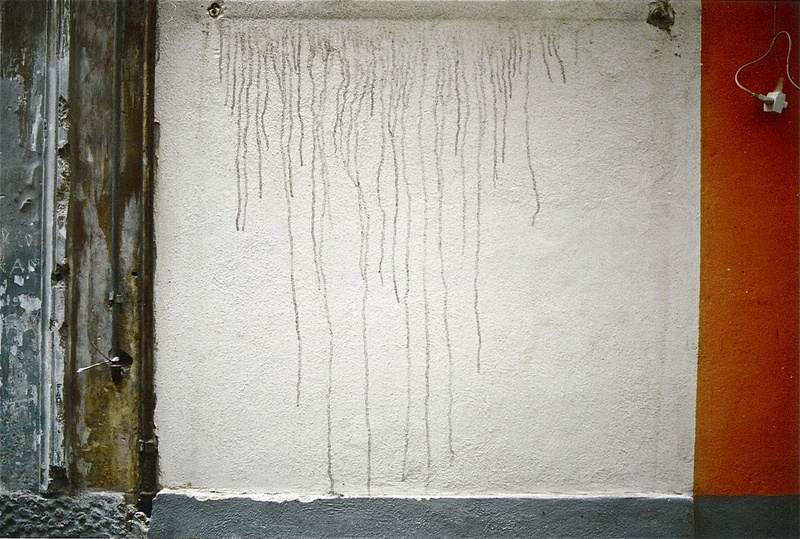 To show the environment – to show where this decay or these structures are, to show where these visual abstractions are actually placed on the wall of a house, that you can see windows, for example, or doors, or a roof or the street leading there, or that there are people walking in front of it – this reality does not exist in any of my images. The opposite is true: I intentionally tear the image out of its context. The images show reality only insofar as this wall does exist and that I have not changed anything about these motifs other than the fact that I determine the crop, which for me is the crucial discipline with photography. So, is that the reason why you also show a contact sheet in the exhibition? Exactly. The contact sheet is there simply to document the work method, to show that the images are not enlarged crops but rather through their crop, they show defined sections of a wall of a house. I’m coming back again here to the question of origin. Do you see a link from your images to those within the history of art that used walls as a medium for imagery, for example, the cave paintings, the frescos in Pompeii, etc. Or are you completely liberated from this? Yes and no. Naturally, I am aware of these images. Especially because I find the civilizational aspect of walls interesting. Walls are actually the most universal form of civilization. Humanity has to protect itself from nature. It has to wrest its habitat from nature, which nature, in turn, wants to recapture. This situation, which leads to traces and structures of the decay on the walls, is what interests me. And to what extent would you say you include this tradition in your images? At the most, on a subconscious level, from a subconscious stance that probably also feeds itself by that means. Even when those al fresco paintings that I look at over and over again in all the churches and palazzi have just been restored, like the “Last Judgment” for example, they still exhibit evidence of the decay. And on a conscious level – what interests you on a conscious level? The decay. An al fresco painting is not made more beautiful by the decay, but a wall is – and this creative energy of the decay, so to speak, is what interests me. That is the starting point, the focus of these images. The walls are exposed to nature in the same way as they are exposed to man and this contest where, on the one hand, natural weathering produces completely new forms, new structures and new colors and where on the other hand, at the same time, man plays a role in almost all images if you study these individually: here he tries to paint over, there to lute, putty or cement over and elsewhere to try to lay a new antenna cable or a new drain pipe. All this together, the interaction of nature and man, this richness of images is revealed here. That is the starting point. If you look at such an image in an exhibit and were standing, let’s say, more than three or four meters away from it, which is sensible with the larger formats, the fact that it is actually a photograph is, in my opinion, completely secondary. It’s quite interesting to hear that you actually use the term IMAGES more than PHOTO, which now leads me to my next question: painters like Antoni Tàpies or the Italian painter, Alberto Burri, as well as the American Cy Twombly, to name a few names, devote their main work exclusively to wall-like structures; this is also their source of inspiration. Is painting your intention, or do you have a purely photographic intention? I would say my intention is one of making images. I love painting. I have always loved painting more than any other visual art, more than sculpture, more than architecture, more than photography. I love the inoperable, the two-dimensional, I would say, the freedom of two dimensions, which also exists in photography. I see these images, that is how it all started. I see these images when I walk through these cities. They accompany me and they become what I call “corner of the eye views”. I constantly see these structures, these images, these possibilities, suddenly to arrive at an image through the constraint of individual parts of a wall in a square . That naturally has to do with a painterly approach in a certain way. It has to do with form, color and structure. These are the same parameters every painting uses as well. I think photography, on the other hand, plays a rather subordinate role; the images are completely simplistic photographically. There are a few parameters, “rules” if you want, to this photography: no direct sunlight on the walls, always photograph from eye level, use a normal lens, so it has the impression of an ephemeral glance at a wall. In regards to the pure photographic technique, a wall practically has no depth of field. Insofar, even aperture and shutter time are secondary. One could say that, photographically speaking, the most simplistic motif of them all is a wall. So can I say that you attempt to approximate painting and compete with it through the means of photography? How images are created and from which medium they are born should not play a part to begin with. If I thus achieve a very similar aesthetic effect for the viewer like a painter does with a much more complex work process, I would see that primarily as completely value-free. I find that art cannot bind itself to that – to how much complexity or how much transpiration is put into a work. I mean, how much can you transpire in 1/60 of a second? The work and effort in the “MURI” actually involves a lot of wandering around, a lot of exploring and looking around. I think I have covered many hundreds of kilometers on foot in these cities in order to see as many walls as possible. Italy is the country you love very much, and you make no secret of that. Rome, Naples, Venice are some of the cities that you have investigated with the “MURI”. Would you say every city’s own character radiates from and is reflected in its walls? Are the walls in Rome different than those in Florence, for example? Absolutely. That has to do with many things. Bologna and Florence, for example, are very bourgeois and were mostly free cities through the centuries when a growing bourgeoisie and thus an accompanying civic duty provided for relatively well-maintained public spaces, which meant that the evidence of decay there is more subtle and finer than in Naples, which, historically was mostly ruled by foreign powers: the Spaniards, the French etc. I would say that the differences lie mainly in the relation between the people and their cities. Naples, you could say, is still kind of ruled by foreign powers – the church and the mafia – which not only leads to poverty and a certain powerlessness, but also rather stokes the anarchistic potential, which, in this case, is released and expressed on its walls. In Naples, one is more oppressed, more religious, more surrendered to one’s fate and, above all, poorer than in the north. The form of the decay is correspondingly more wild. As you told me about your project for the first time a few years ago, you placed a particular image in my head. Today, after we have organized this exhibit together, I recognize the beauty and it not only makes a painterly impression on me but also imparts a very romantic poise. I know that you see that differently. I mentioned that, because we have been speaking about it for a couple of years and had many discussions about art and other things, and I know that it almost appears as a need for you to place harmony in question. Actually, for me, it is more about the romantic term; these images are very romantic in their beauty, their colorfulness, in their structures even if they are fleeting. But I know that you have a wider spectrum than what I can see there. What is your attitude to this? My attitude has always been that there is a great creative energy in decay, in destruction. I would not call it romantic, at least not superficially. The more classical romantic attitude obviously would be to show the grandezza of well-maintained walls, which can still be found on every corner in Italy, to show the artful masonry, this unbelievable tradition displayed in the architecture of Italian cities, – similar to how an illustrated book would show it -, and insofar as this is concerned, I rather pull the romantic out of the opposite. Let’s take Visconti’s “Death in Venice” for example, I don’t see anything different here. I see the decay of a person that has an unbelievable amount of beauty. Naturally one can argue whether a close-up of an old homosexual man, whose color is running out of his beard because the heat is so great, is a beautiful image or not. For me, it is a beautiful image. In decay is beauty. In decay is also a certain romanticism because the conceivability that the decay -or death for that matter-can be beautiful is inherently romantic. “Work in progress” indicates that, in a couple of years, your images are not going to be able to be traced. Is that the appeal, that masonry and photography are transitory? “Work in progress” simply means that the walls themselves are a “work in progress”. That interests me, and it is I employ for myself when I go through these cities and turn my head at the right time. I could of course also photograph the “work in progress” in Berlin. I would have to go about it with a completely different approach there that might certainly be interesting but wouldn`t have anything to do with this romantic poise that you rightly mentioned. In essence, this beauty from the decay is not encountered in Berlin. You mentioned earlier that the images are always photographed from eye-level. What do you mean exactly? There are certainly interesting things above and below eye-level. What is so important about the eye-level? It’s not so much about the eye-level but rather that the camera is always aimed directly at the wall simply to preserve the perspective, so that the alignment does not diverge. Most walls show geometric structures, rectangles, squares; and when they naturally diverge in their perspective or in their crop or are not adequately displayed, then they do not make these images naturally any better; and that is also no longer the appeal of the concept, which consists in that one follows this perspective of the corner of the eye, this nearly subconscious seeing, and then one simply turns one’s head and can practically right away take the photograph. So can we assume, when you say you crouch, that it is the perspective of a child? For example. But it is rather the exception. More than 90 percent of the pictures are shot from eye-level. As I said, when you begin to tilt the camera up or down, the perspective becomes distorted, and that takes away much of the directness that is very important to me. Yes, this…I am looking at a wall.